Janelle In Real Life: oversized & classic rock. Sometimes I wear a giant sweater and a giant scarf at the same time. And guess what I'm doing right now? I'm watching a documentary about The Eagles with my husband. They are his FAVORITE band and he gets so giddy when he watches it. I like The Eagles because my parents made us listen to them over and over on every road trip between Oregon and Utah and the songs were forever engrained into my brain. Now whenever I hear one of their songs I'm like "Oh, I like that!" but I should really be saying "Oh, I know every single word to this song, so that means I like it, right?" Regardless, their incessant playing of classic rock on road trips has made me into a classic rock fan. And that's good news because Steven and I really bonded over the love of that genre and I'm pretty sure that's why he liked me initially. If not for that, maybe he would have thought I was lame? So thanks for that parents. What is your musical genre of choice? You look gorgeous! I love that knit scarf and your lipstick color! Thank you! I loooove the color of the scarf too! I wear it all the time. Thank you! I'm obsessed with the color for sure! I love the Eagles too! I grew up listening to my parents' music so they are still preferable to me than whatever is on the radio nowadays. 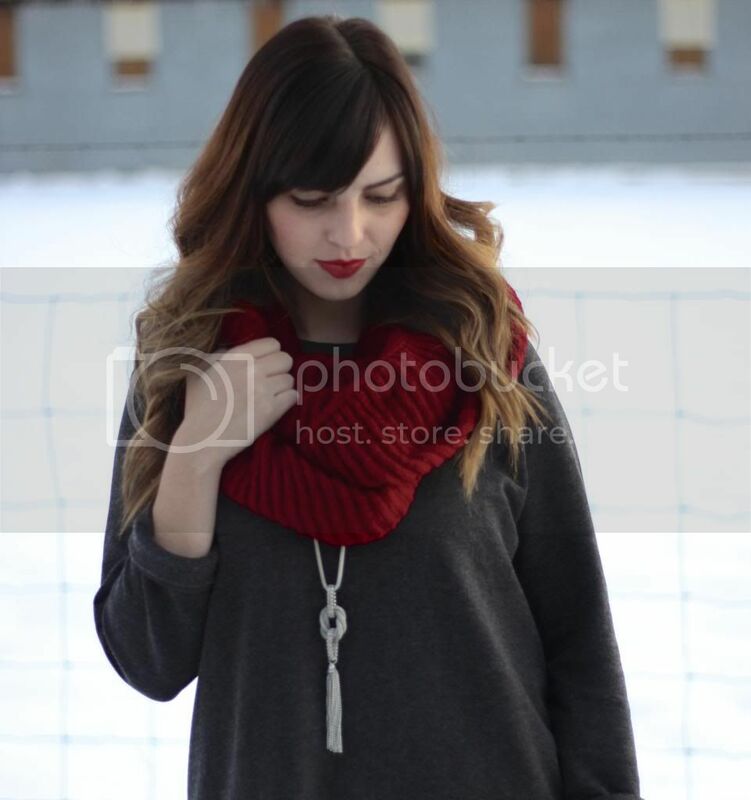 Love your chunky red scarf. :) I've been looking for one! I love this outfit on you! Make sure to stop by my blog to have a chance to win a Nordstrom giftcard! Haha, I'm definitely not creeped out. But thank you and I'll definitely stop by! Love this outfit with that pop of deep red! I love that necklace! It goes with everything. you look so chic and cozy - i love that you layered the scarf and long necklace. Cozy and chic is what I strive for... so thank you! Man, Janelle, very nice. You look great in red lipstick, definitely your color.